The Woodstock Neighborhood Association held its first plant sale in 1989 in an effort to raise funds to prune the recently planted street trees along Woodstock Boulevard. Twenty-four years later, the neighborhood continues to host this locally treasured event and amazingly, some of the original organizers are still involved today! Jan Elliott is one of these inaugural organizers and plant contributors, whose plant donations fill two pick-up loads some years! In addition, Terry Griffiths has continued on since the event’s inception and serves as the current Plant Sale co-coordinator. Lonnie Port has served as the plant sale’s lead cashier for nearly ten years. 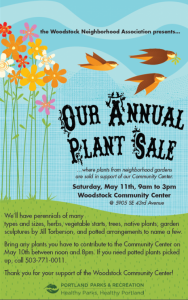 While the plant sale has continued year after year, the intended use of funds has changed from tree pruning to the neighborhood foot patrol to its current incarnation as a fundraiser for the Woodstock Community Center. Back in 2003, Portland Parks and Recreation (PP&R) notified the Woodstock Neighborhood Association (WNA) that the center was slated for closure due to its small size and proximity to the Mt. Scott Community Center. This came as a devastating blow to the community, but rather than accepting this as a reality, neighbors organized to take action forming what eventually became the Friends of Woodstock Community Center (FWCC). This subcommittee of the WNA proved to be incredibly savvy and managed to save the community center from closure through a combination of lobbying and fundraising efforts, and eventually forging a partnership agreement with PP&R which has succeeded in keeping the community center revenue neutral. The center is no longer subsidized by the City of Portland’s general fund. The FWCC has negotiated several multi-year Shared Use Agreements between PP&R and the WNA and is on the verge of signing a second 5-year agreement. For the past decade, the FWCC volunteers have worked tirelessly to uphold their end of the agreement, which stipulates that they are responsible for routine maintenance. Volunteers have taken on many of the day-to-day tasks over the years from cleaning chores to leaf raking to boiler maintenance. They have also taken some proactive steps to improve the overall appearance and function of the space. 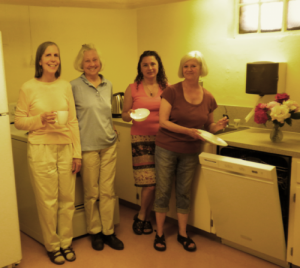 The FWCC coordinated the lead abatement and painting of the building, raised funds to purchase and install a new sign for the front of the building, and secured a grant for upgrades to the kitchen and purchase of dishes, flatware and an energy efficient dishwasher that makes the center a very sustainable option for events and rentals. In 2011the FWCC partnered with PP&R to install new laminate flooring. PP&R has arranged for the FWCC to manage one weekly rental as a way to raise additional funds to help cover custodial costs. Terry Griffiths, Elizabeth Ussher Groff, and Lonnie Port have been three core volunteers with the Friends of the Woodstock Community Center for the past ten years. Along with current FWCC financial manager, Ann Crowder, they have spent countless hours on the committee over the years and still manage the building maintenance and events like the Plant Sale with a smile. I asked them how they find the time and manage to stay committed and received very humble responses. Terry shared that she is “very persistent” and enjoyed “the rush” she got from managing to save the WCC from closure. It’s clear that Lonnie, Terry, Elizabeth and Ann have a sense of pride and ownership in their little neighborhood treasure and rightly so. While they have valued their time with the FWCC, they do welcome support from neighbors who want to step up with their support. So, if you live in the neighborhood and are looking for a fun way to give back to the community consider volunteering as a member of the FWCC. They are a fun group! All proceeds for the Annual Pre-Mother’s Day Sale go directly to the Woodstock Community Maintenance Fund and support the volunteers’ efforts to provide routine maintenance to the site. This year’s event will be held on Saturday, May 11, 9AM-3PM at the Woodstock Community Center, 5905 SE 43rdAvenue.